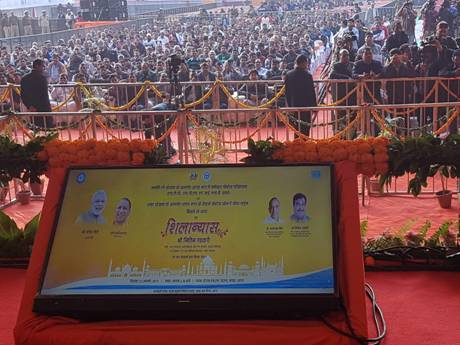 Union Minister for Water Resources, River Development and Ganga Rejuvenation, Road Transport & Highways and Shipping Shri Nitin Gadkari laid the foundation stones of six Namami Gange projects in Agra and Mathura today. Speaking on the occasion, Shri Gadkari said, on completion, these projects will be beneficial to lakhs of people in this area. He said, the government is steadfastly working on cleaning the river Ganga and its 40 tributaries and major drains. He said, the government is concerned about maintaining the ‘aviralta’ of the river Ganga and has made the e flow notification for this. The four projects in Mathura have a sanctioned cost of Rs 511.74 crore. These include two sewerage projects - an integrated sewerage infrastructure for the city on Hybrid Annuity Mode with ‘One-City-One-Operator’ approach and reuse of treated sewage water in Mathura refinery at a sanctioned cost of Rs 460.45 Crore, and the other for rehabilitation of sewerage infrastructure and augmentation/upgradation of STP at Vrindavan at a sanctioned cost of Rs 33.82 Crore. There is also a project for cleaning of 27 Ghats at a sanctioned cost of Rs 3.60 crore. For abatement of Industrial Pollution, there will be a project for upgradation of infrastructure of existing CETP for Textile Printing units at the Mathura Industrial Area at a sanctioned cost of Rs 13.87 Crore. Mathura city has been divided into four sewerage zones. The current sewage generation is 47 MLD which is expected to increase to 61 MLD in 2035. Total sewage treatment capacity available in Mathura is 44 MLD. Mathura sewage scheme under Hybrid Annuity based PPP mode (HAM) is first of its kind in the history of waste water treatment in the nation, for integrating the rehabilitation and operation of existing treatment infrastructure along with the development of new Sewage Treatment Plants (STPs). Union Minister for Water Resources, River Development and Ganga Rejuvenation, Road Transport & Highways and Shipping Shri Nitin Gadkari addressing the gathering after laying the foundation stones of Namami Gange projects in Mathura today. The projects in Agra include comprehensive Sewerage Scheme for the city with ‘One-City-One-Operator’ approach on Hybrid Annuity Mode for creating new STPs of 176 MLD, upgradation, rehabilitation of old plants and O&M for 15 years at a sanctioned cost of Rs 857.26 Crore and construction of Sewerage Network in Western Zone, for laying of 251 Km sewer lines, 47,827 house connections, rising main of 3.80 Km under AMRUT Scheme at a sanctioned cost of Rs 353.57 Crore. The city is divided in 9 Sewerage Zones. The corresponding sewage generation in Agra is estimated at 268 MLD (2020) and 341 MLD (2035). It has a sewerage network of 513 km with 9 STPs having installed treatment capacity of 221 MLD exists in Agra, but these STPs are treating only 145 MLD flow. There are 90 drains having cumulative discharge of 206 MLD in Agra and only 29 drains with tapping capacity of 145 MLD exists in Agra, resulting into discharge of approx. 141 MLD sewage directly into river Yamuna. A comprehensive sewerage project has been sanctioned under Namami Gange at a cost of Rs 857. 26 crore. The project is adding, in one go, additional treatment capacity of about 176 MLD to existing 221 MLD developed over several years under different schemes (77.5% increase). Union Minister for Water Resources, River Development and Ganga Rejuvenation, Road Transport & Highways and Shipping Shri Nitin Gadkari laid the foundation stones of Namami Gange projects in Agra today.